We can offer you 25 sleeping accommodations. Our prices start at 8€. Despite that we provide maximum comfort close to home conditions. In the kitchen you can drink a cup of coffee and heat up your food in any time of the day. Bathrooms have everything you need to refresh yourself. Perfect for a first night in Riga, staff so accommodating to let me use facilities after I’d checked out too thank you so much awesome place! Really nice hostel. It is along big road so heavy traffic noise all night long. Stayed here last year. Management changed but facilities still the same. Very convenient to transportation and to city sites. 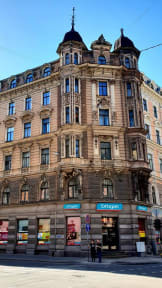 The hostel is well located and has stores near. Bus and train station really near too. Everything was clean and the staff tried to answer our questions when needed. The common room has good space and access to the hostel was easy at all times The amount of toilets is low for the quantity of people hosted, and in the night it is a little loud as we had to keep the windows open. The bunk beds don’t allow you to sit as the space is really low. Staffel is really friendly and hostel atmosphere is a more quite but really nice! 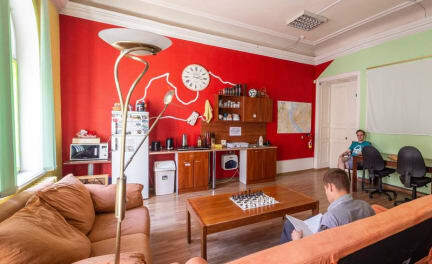 good base location, good common room and shared bath, but it is off the major road, so traffic noise can be disturbing, both late at night and early morning. It's not a place to make friends. 4 starts of hell. Expect the unexpected (Tarzans, serial killers, Russian mob, lost Korean colony, cocooned Germans). You name it. You'll probably get it. All in all, surprisingly unappealing. Otherwise fabulous!